Over 11 GB Loops & Grooves for rock, indie, and much more. The library contains an enormous collection of Instrument Kits that give you the freedom to simply use one layer of the instrument by itself or increase the depth, complexity and beauty by adding additional complimentary instrument parts. Crush includes Vocals (Female and Male) Acoustic Drums (Stereo, Hits and 24-bit WAV Multi-Drums) Electric Bass, Electric Guitars, Pianos, Keys, Synths and so many additional instruments that provide you with today's rock sound. By giving you the ability to add the amount of depth and texture needed, along with multiple variations and rhythmic figures, Crush gives you total creative freedom and allows you to tweak to your hearts content! 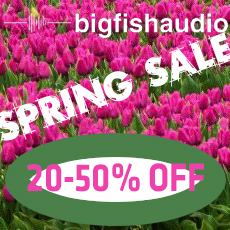 Crush Kontakt patches (Kontakt 4 and Kontakt 5) are part of Big Fish Audio's KLI Series and includes a custom user interface with various features to help make it easier to customize the include loops and sounds exactly how you want. Auszug: Crush punktet als ergiebige Fundgrube Chart-tauglicher Phrasen für Alternative, Indie und Pop Rock. Neben der exzellenten Audioqualität sind die umfangreichen Klanggestaltungsmöglichkeiten der Kontakt-Instrumente positiv hervorzuheben.